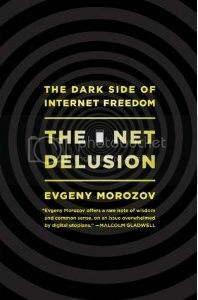 NOTE: This is the first in a series of posts reviewing the book “The Net Delusion: The Dark Side of Internet Freedom” by Evgeny Morozov. Here are the links to the first post, second post, and third post. I just started reading Evgeny Morozov‘s new book The Net Delusion. I originally planned to just read the book through and review the whole thing (which I’ll still do), but after 50 pages I already have so many notes that I think it might be best to analyze the book in a series of posts, of which this is the first. Those of you who are familiar with Evgeny’s rhetorical style know that it can be like a heat-seeking missile… effective but sometimes unnecessarily brutal. In some of these posts I come down pretty hard on Evgeny for this unnecessary roughness, yet I don’t want to mirror his behavior. So I suppose this is a disclaimer: I am not critiquing Evgeny’s ability but his rhetorical choices. And while this post is pretty harsh, later ones will be nicer. As many reviewers before me have noted, this is an important and well-written book. It gives the best research so far into the extent of digital repression under authoritarian regimes, what Morozov calls “the dark side of Internet freedom.” Yet the book has weaknesses too, both in its rhetorical choices and its content. I’d like to begin the discussion of these weaknesses and strengths, with Morozov’s analysis of the digital aspects of the post-election protests in Iran in 2009. In this chapter, entitled “The Google Doctrine,” Morozov makes an important choice. Instead of trying to explain the true role of the Internet in those protests, as Philip N. Howard did to excellent affect in a few well-researched pages in his book The Digital Origins of Dictatorship and Democracy, Morozov chooses his targets’ weakest argument – that it was a “Twitter Revolution” – and then successfully debunks this myth, a task that has already been achieved by other commentators and analysts. By choosing a rhetorical stance that will allow him to score easy points rather than truly elucidate an important case study of digital activism and repression, Morozov choose an analytical strategy that is rhetorically effective but journalistically lazy. Morozov goes into great detail describing the eager adoption of the Twitter Revolution theory, quoting prominent talking heads in American media and laying particular blame at the feet of the Department of State in general and Jared Cohen, in particular, a member of the Policy Planning Staff who wrote the much-heralded and then much-ridiculed email to Twitter asking them to delay scheduled maintenance and keep their service going for the good of the revolution. This was globalization at its worst: A simple email based on the premise that Twitter mattered in Iran, sent by an American diplomat in Washington to an American company in San Francisco, triggered a worldwide Internet panic and politicized all online activity, painting it in bright revolutionary colors and threatening to tighten online spaces and opportunities that were previously unregulated. The argument that Jared Cohen alerted the Iranian government to digital activism or “triggered a worldwide Internet panic” seems far-feteched, especially given that Iran has practiced political censorship of Internet content since 2001 and Morozov himself has been chronicling digital repression around the world for years. However, this argument is important to the overall rhetorical aim of the book, to utterly delegitimize the State Department’s Internet freedom agenda. There are many legitimate criticisms to be made on this score, but blaming Jared Cohen (or even the State Department) for Iranian digital repression is not one of them. Why does Morozov overreach when he has so much fodder for stronger arguments? Even though it was Secretary of State Hillary Clinton who initially enunciated the Internet freedom agenda in January 2010 and even though the White House stated publicly that Cohen’s email “wasn’t a directive of the Secretary of State, but rather was a low-level contact from someone who often talks to Twitter staff,” Morozov seems intent on making Cohen the State Department whipping boy and blaming him for the “digital purge” following the elections and for digital repression around the world. A few pages later, after discussing a 2010 report by the Chinese Academy of Social Sciences detailing the political implications of the Internet, Morozov states that “it’s hard not to see this as a direct response to the words and deeds of Jared Cohen.” This is even more outrageous than the Iran accusation. That the policy of China, which has the most sophisticated online censorship regime in the world, was significantly altered by Cohen’s email to Twitter seems unlikely. If anything it merely confirmed suspicions they already held about American technologies. One of Morozov’s weaknesses is his fondness for ad hominem attack, and I think that is at work in the harsh criticism of Cohen. Rather than being based on empirical analysis, Morozov’s attacks seem personal. Unlike anyone else in the chapter, Morozov identifies Cohen’s relatively young age as a way to discredit him, yet Morozov is actually a year younger than Cohen. Does Morozov see Cohen, now Director of the new think tank Google Ideas, as a rival for up-and-coming intellectual phenom of digital politics? Regardless of his motives, when Morozov gets personal the quality of his reasoning suffers. Conclusion: Iran post-election digital activism is a myth. Yet Twitter was not the sum total of the Green Movement’s digital activism. As I noted earlier, Philip Howard describes the use of digital technologies by Iranian activists in great detail in the beginning of his book on digital dictatorship and democracy. However, since the book was published at the same time as Morozov’s, I’ll give him the benefit of the doubt and assume that he did not read Howard’s book before it was published. With regard to the post-election protests, decisions are made centrally by Mousavi and Karoubi and their campaigns. When they take their decisions they communicate them in different ways. First, they publish them on their websites, for example Kalamhe and Ghalam news. Web 1.0 (as well as totally offline communication methods) are just as important as Web 2.0 (social media), though the latter is receiving for more attention. Second, the reformist leaders use social networking systems to communicate these message. On Saturday Mir Hussein Mousavi‘s Facebook published the news that demonstration will be held today. Mousavi has more than 65,000 supporters in his Facebook group and every message can reach this army of people directly. Supporters were also asked to pass the message to others, implying that the leaders are deliberately making use of their supporters’ online and offline personal networks. Morozov himself states that “poor understanding leads to poor policy” and excoriates both journalists and members of the US governments for their lack of understanding of digital repression which, he notes, can mean heavy consequences “where human lives are at stake”. Given the life-and-death context in which he places the issue, he also casts his own decision to go for the easy win, rather than elucidate the real role of digital technology in the uprising, in a moral light. Later in the chapter Morozovs goes off attack mode, and his more even-handed claims are useful and important. He lists a series of key questions that the US government must answer in order to improve their Internet policy: “How should the West balance its sudden urge to promote democracy via the Internet with its existing commitments to other nondigital strategies for achieving the same objective…? What are the best ways of empowering digital activists without putting them at risk?” He also rightly calls out Facebook and Twitter for not signing on to the Global Network Initiative, an agreement by tech companies to behave in accordance with high standards of freedom of expression and privacy. His description of the Iranian government’s digital purge is well-researched and edifying. Morozov adds most to our knowledge of digital activism and repression when he is acting in the role of a journalist and trying to offer constructive advice for reform. Yet in this chapter he seems to prefer writing witty barbs and scoring rhetorical points. It makes for entertaining reading, though much else is lost.